Claustrophobia. Such an evil topic, yet so easy to make a film on (and so easy to do it wrong). Paranormal Activity can be considered as mildly claustrophobic; as the entire film takes place in one house with a minor number of characters. But what if we magnify that by, say, 1000% and spend 90 minutes with one person in a coffin, in the dark, buried several feet underground? Can it really be as engaging? Will it manage to get increasingly more intense, until the viewer feels the pain and suffering of the only visual character? Well, yes. Yes it can. 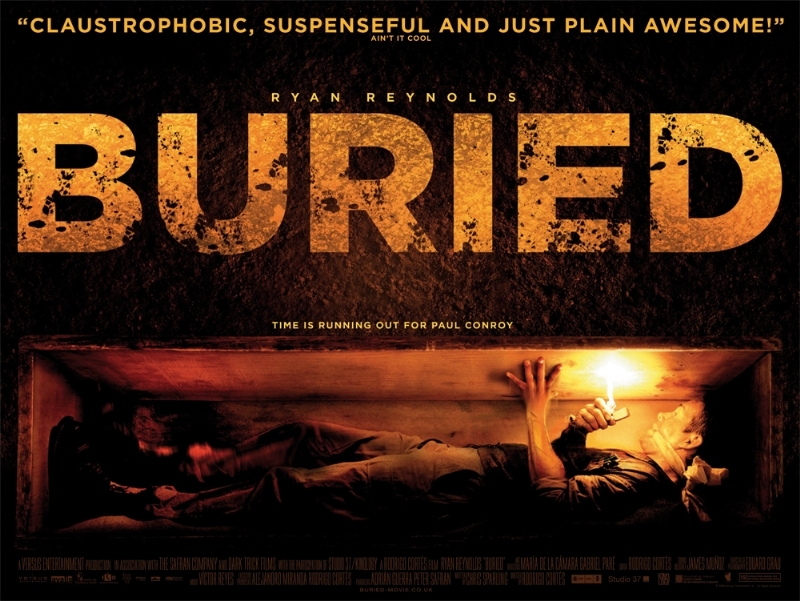 "Buried" shows the event of Paul Conroy (Ryan Reynolds) being sealed in a coffin, a few feet under the surface of a desert. He is an American truck driver, delivering an order in Iraq with a convoy of other lorries. (Unseen to us, but later told) they are all killed by Iraqi citizens wielding guns, with the exception of Paul. He awakens inside the coffin, with nothing but a lighter and a mobile phone. The oxygen is running out, the phone's signal is temporary and the battery is depleting...but worse, the coffin is slowly filling with sand. He has 90 minutes to live, but he's not ready to die. Let me start be saying: Bloody Hell, this film is intense! I can guarantee you that this will be possibly THE most intense film you will ever see. It may start slowly, but once it gets into it, it really does grip you. The music is loud, sudden and adds to the 90 minute intensity session. And, of course, the fact that the entire film is set in a coffin does help. I can also add that Ryan Reynolds is superb. Whether he's yelling at people over the phone, groaning under the sand or shouting for help, he delivers every scene with perfection. The ending is particularly emotional, and you can't help but feel unbelievably sorry for the only protagonist. So, 90 minutes, one character, one environment; how can the film stay entertaining? Well, entertaining is hardly the word, but how does it keep the viewers attention? It's because every 10 minutes, something new is discovered; ranging from a call from the people who put him there, a demand of him to amputate a finger and a snake for him to spend a little bit of time with. This keeps the gruelling 90 minute experience fresh, and gets the viewer feeling more involved with every twist and turn. Another thing; this film is most certainly NOT for the faint of heart. It's astonishingly intense, it's terrifyingly frightening at many points and there is a horrific amputation scene. (MINOR SPOILER) The terrorists who put him there have requested for him to "show blood" and so, eventually, he takes a knife, puts a gag in his mouth, and starts sawing at it. You don't actually see the amputation, but there are graphic noises including a horribly loud snap as he cuts through the bone. You see the finger afterwards, and the result is extremely bloody. However, people who have seen 127 Hours, and lived through that amputation scene, may find this one rather pathetic! So, despite this being an enthralling and harrowing experience, it does contain a few flaws that prohibit me giving it a full 100%. Mainly, the film does take a while to get going. We first see him after a not-very-impressive six minute opening sequence, and he receives his first call about 10/15 minutes in. During this time, not much has happened and it does get boring very quickly. However, this is almost redeemed by the nature and effect of the film further in. Also, there being only one character, we get no character development. Paul Conroy goes through so much pain and so much misery that we as a viewer really want to feel sorry for him. This aspect is partly redeemed by Reynolds's fantastic acting, and the ending really is highly intense and emotional. To Summarise: Despite a rather slow start, "Buried" is very well acted and it contains enough intensity to make it one of the most gripping and claustrophobic films of all time.